When tracking expenses in Apptivo, there are individual “expenses” and then “expense reports” which contain expenses. You’ll commonly refer individual expenses referred to as “expense lines” as well. You can either create an expense report, and enter multiple expenses at once, or in this case, add a single transaction to be submitted later. Apptivo’s expense report software also allows you to connect credit card transactions, which are treated the same as any expense you manually enter. Expense reports are the one or more expense lines, create a expense report and submit it for an approval to a manager. We make it easy to create expense reports using multiple existing expense lines so you can reduce the amount of time spent to re-record all the expenses in report and submit it to manager. You can connect bank account to the Apptivo Expense Reports App. After connecting the account, you will be able to sync all transactions from your credit cards or bank account, and then include these transactions within expense reports. 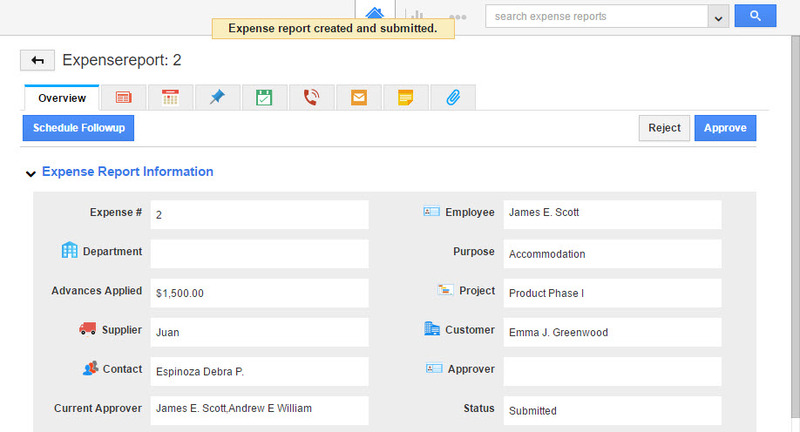 The expenses reports submitted by your employees can be viewed in “My Employees Expense Report” menu. It allows you to view the Expense Report waiting for your approval i.e your employee had submitted the expense report to you for the approval, Expense reports waiting for others approval i.e your employee had submitted the expense report to the third tier manager which is termed as waiting for hierarchical level approval and at last the “Approved” and “Rejected” which will show the approved and rejected expense reports in the appropriate menu. These are the seeded values that system provides to filter the records accordingly. By status allows you to filter the expense reports based on their status. Expense Reports statuses has the seed values as default they are “Not Submitted”, “Submitted”, “Approved”, “Rejected”, and “Resubmitted”. You would also view your own expense report status. From this view you are also allowed to perform bulk action against expense reports records. 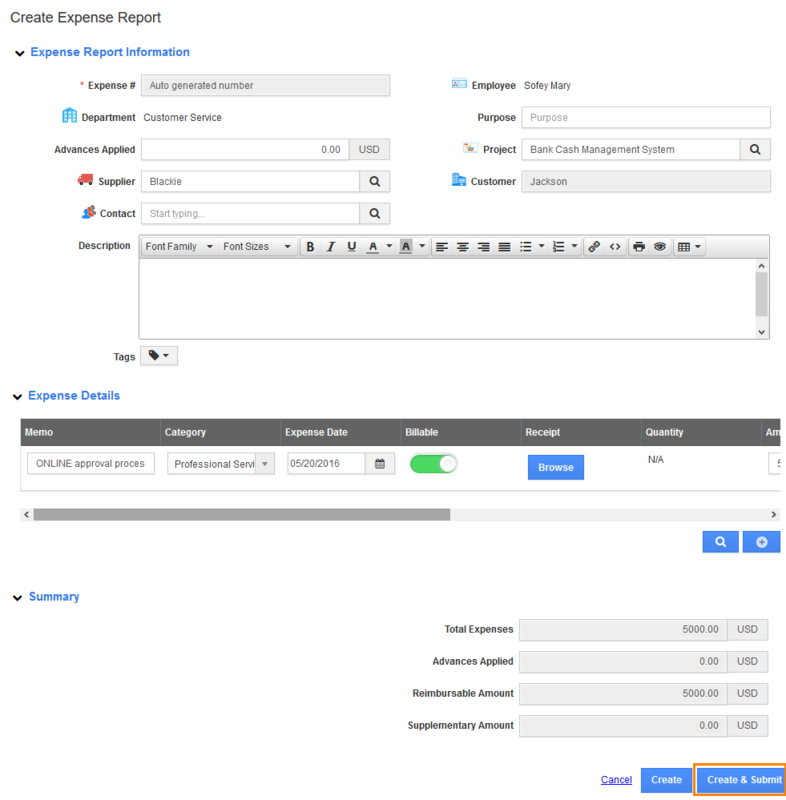 When tracking expenses in the CRM, there are individual “expenses” and then “expense reports” which contain expenses. You’ll commonly refer individual expenses referred to as “expense lines” as well. You can either create an expense report, and enter multiple expenses at once, or in this case, add a single transaction to be submitted later. Log in and access Expense App from your universal navigation menu bar. Click on “Create” button from the left navigation panel. Click on “Create” button to complete. Click on “Create” button and select “New Expense Report”. You will view creation page at the right side, Note: Following are the fields on this page are the same as the fields on the Create (or Edit) Expense Report Page. Expense # – This is an autogenerated number, you can also manually key in the value by configuring the setting. Department – This field will be auto populated with the value from employee record and other basic information like supplier name, customer name, contact name, description, etc,. Summary – Total amounts for an expense report and any accommodation charges added in expense lines. Click on “Create & Submit” blue button. Click on “My Employees Expense Report” menu from left navigation panel. The following Expense Reports are the automated default values that behaves as per the action performed against expense report. The expense reports that are created and waiting for your approval will be stacked under “Pending My Approval”. The expense reports that are approved by the approval manager will be in “Approved” status. The expense reports that are rejected by the approval manager will be in “Rejected” status. The selected menu will display results at the page center of the dashboard. The below image displays the results of “Pending My Approval” expense reports. 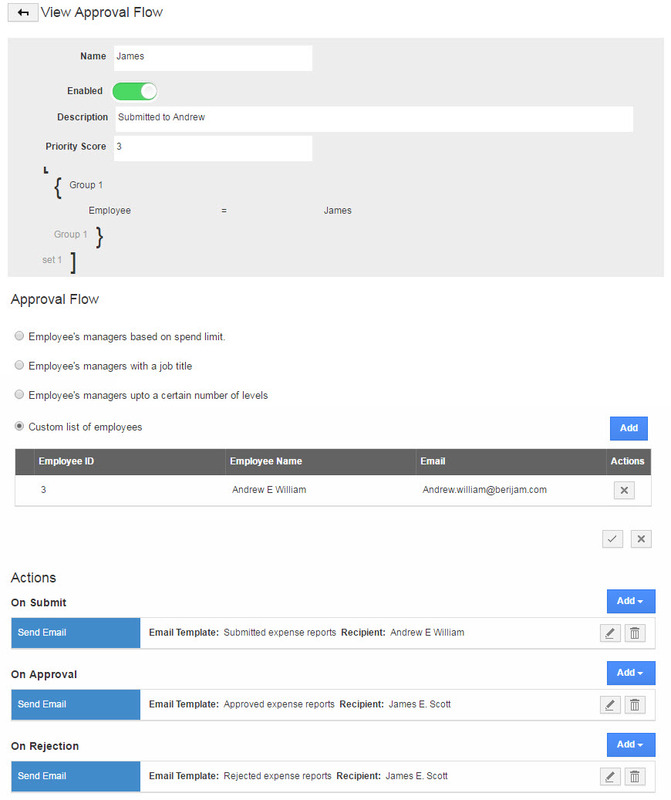 Our Approval flow is simple and elegant – allowing complete collaboration and follow-through to make sure your expenses are logged correctly and viewed by your manager. App allows you to create as many approval flows as you need. 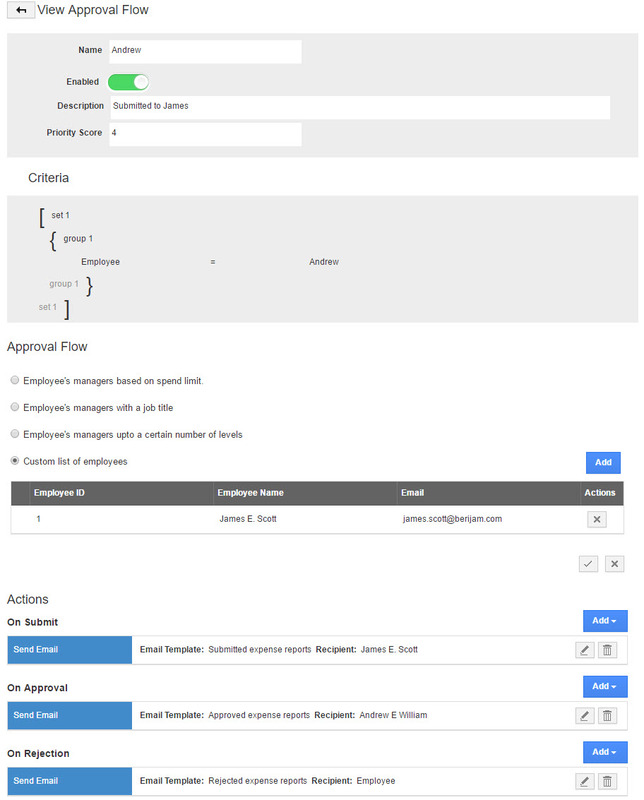 How does the simple approval flow works in Expense reports? After an employee submit an expense report, it goes through the approval flow. The approval flow can be performed by one or many managers sequentially. The criteria established in Approval flow setting filters which expense report an approver sees in his or her queue. 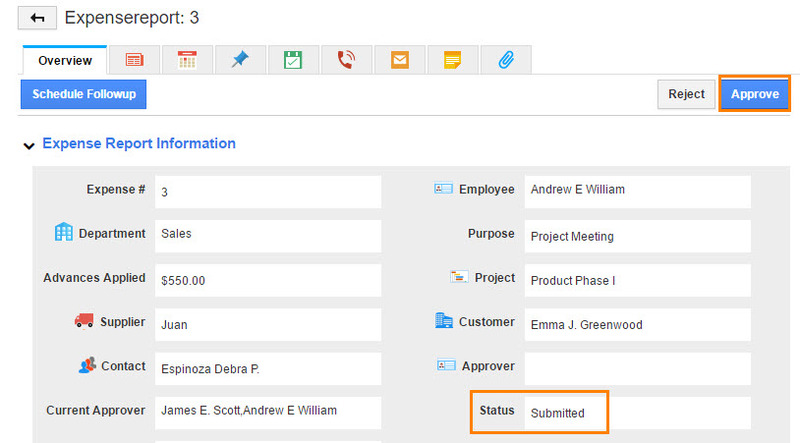 You can add the custom list of employee, who can approve or rejects the expense reports. In an organization, James, Andrew, and Jammie are employees who have reputed roles. James and Andrews are super users. Jammie has managing expense reports role, he can only create and submit his expense reports not to approve or reject other users expense reports. In this scenario, James and Andrew are the super users. The expense reports can be created by James and it has been approved by Andrew. James created and submitted the expense report. Andrew will login to his account and check for “Pending My Approval Expense Report”. 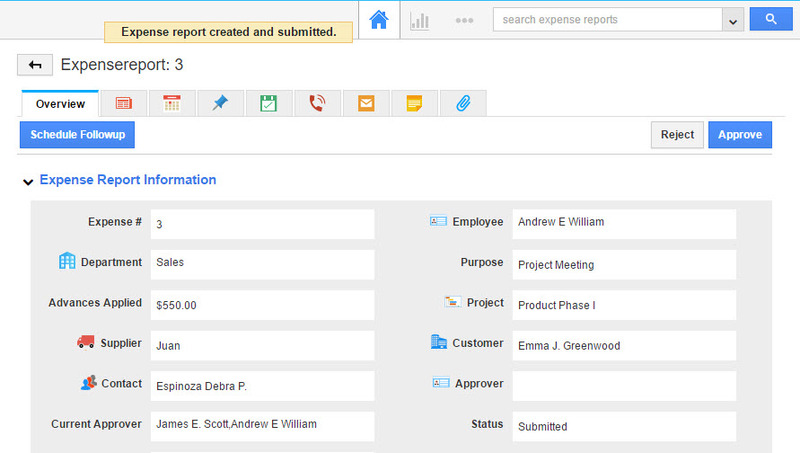 On the detailed view of expense report, Andrew can view “Approve” action button. James can view his approved expense report in “Approved” status of his login. In this scenario, James and Andrew are the super users. The expense reports can be created by Andrew and it has been approved by James. Andrew created and submitted the expense report. James will login to his account and check for “Pending My Approval Expense Report”. On the detailed view of expense report, James can view “Approve” action button. In this scenario, James and Andrew are the managers for Jamie. Jamie used to create expense reports, which has the total expenses is greater than or equal to 1. Custom List of employees: Andrew and James. Employee must create and submit an expense reports, the employee’s managers will approve the expense report submitted by employee. 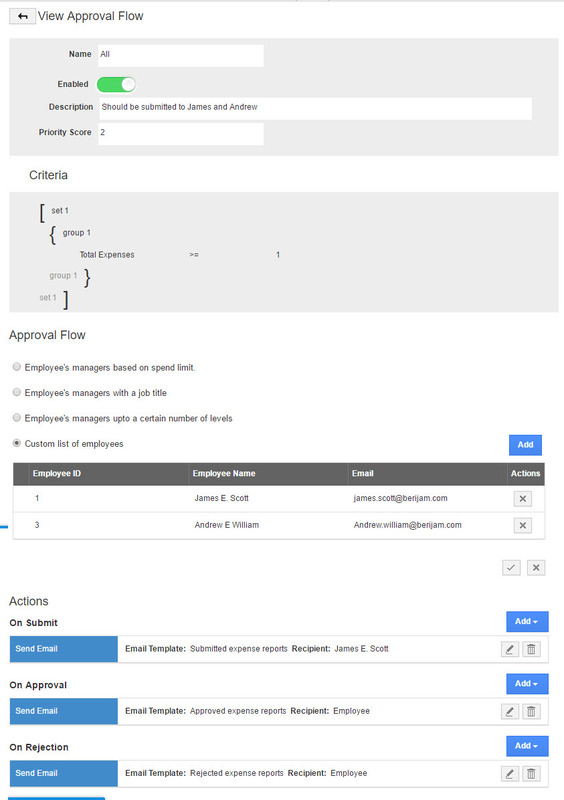 Here, employee’s manager is James, but we added two super users in a custom list of employees. So, the expense reports submitted by employees can be approved by James and Andrew. James or Andrew will login to his account and check for “Pending My Approval Expense Report”. 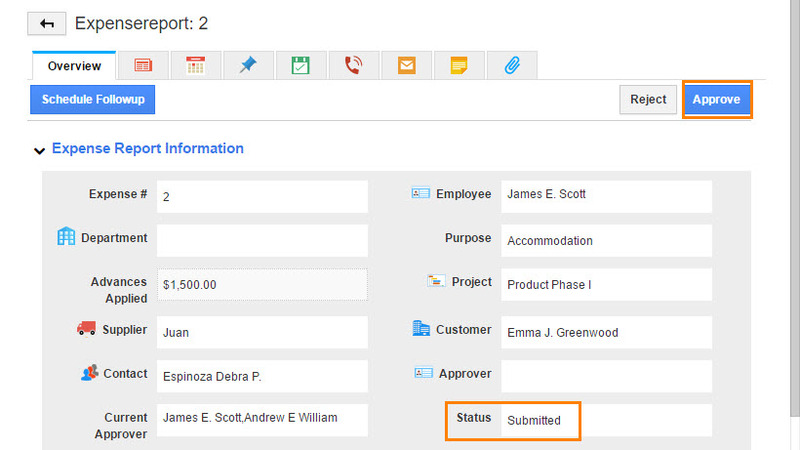 On the detailed view of expense report, James or Andrew can view “Approve” action button. Jamie can view his approved expense report in “Approved” status of his login. Expense Reports app has many default standard reports. This report allows you to view the Expense Reports created By Customer. Click on Reports Icon located at the app header bar. You can view “General” drop down in left navigation panel. Click on “Expense Reports by Customer” from “General” drop down. Customer Name – Search and select Existing Customer Name. Start Date – Start date. End Date – End date. Click on “View Report” button to view report in dashboard itself, as shown in below image. Expense Reports app has many default standard reports. This report allows you to view the Expense Reports created By Supplier. Click on “Expense Reports by Supplier” from “General” drop down. Supplier – Search and select the Supplier Name. Expense Reports app has many default standard reports. This report allows you to view the Expense Reports created for the projects. Click on “Expense Reports by Project” from “General” drop down. Project Name – Search and select the existing Project. Expense Reports app has many default standard reports. You can able to view the Expense Reports by their Employees using an report option called “Expense Reports by Employee”. Click on “Expense Reports by Employee” from “General” drop down. Employee Name – Search and select the existing employee.